Water Warriors (2009) Aqua Pulse Series by Buzz Bee Toys Inc. :: :: iSoaker.com ::: iSoaker.com | Information | The Armoury :: Article Listing - Water Warriors (2009) Aqua Pulse Series by Buzz Bee Toys Inc. 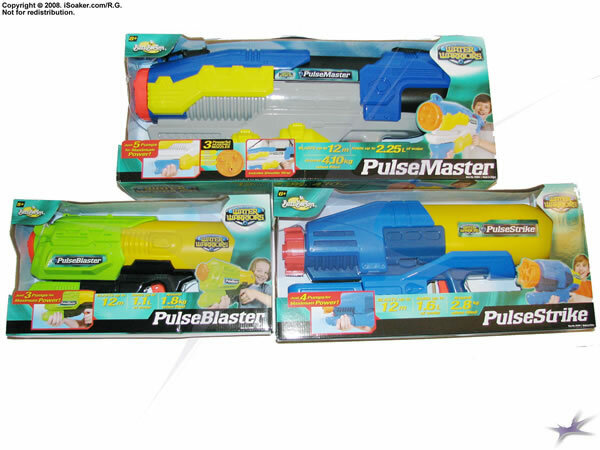 While appearing on store shelves down in Australia in late 2008, the Aqua Pulse Series by Buzz Bee Toys Inc. is still being considered a 2009 model for the 2009 North America Summer. As Fox on iSoaker.net first posted, Buzz Bee Toys Inc. has something new to offer the avid water warrior this coming season. Of course, with these models now in hand, testing of each blaster will begin and we shall see how our measured stats compare to the reported ones. However, from initial tests, these blasters perform quite admirably despite the slightly small volume of the pressure chamber. Summer, 2009, should be a real blast! More to come as full reviews become available.